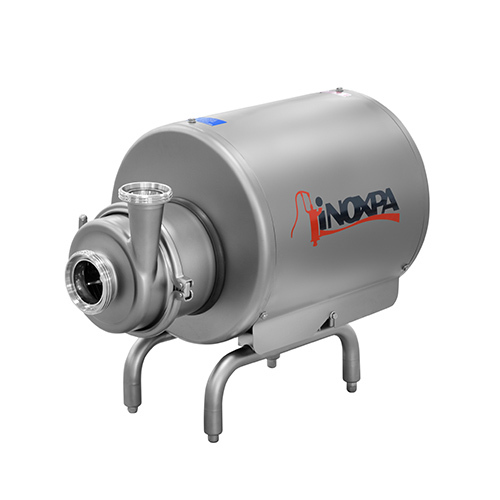 The sanitary and cost-efficient design of the Hyginox SE centrifugal pump makes it particularly suitable as main process pump in the dairy, beverage, pharmaceutical and cosmetic industries. 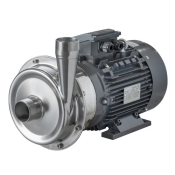 Hyginox SE is a close-coupled food-grade centrifugal pump with sanitary design, compact and efficient. 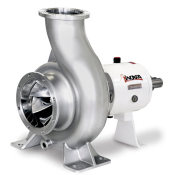 It is made of a cold-formed stainless steel casing, stainless steel open impeller (investment casting), mechanical seal, pump cover, lantern and shaft, connected to the motor shaft by mechanical compression. 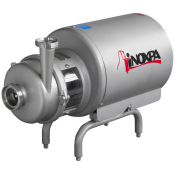 The motor complies with the IEC standards, it is protected with a stainless steel shroud and provided with the height adjustable hygienic designed legs. Triphasic induction motor with B34 flange (B35 for motor frame 132 and above), in compliance with the IEC standards, 2 poles = 3000/3600 rpm, efficiency class according to EC regulation, IP 55 protection and F-class insulation. Summary Debido a su diseño sanitario y económico, la bomba centrífuga Hyginox SE es especialmente indicada como bomba principal en los procesos de la industria láctea, de bebidas, así como en la industria farmacéutica y cosmética. Summary The sanitary and cost-efficient design of the Hyginox SE centrifugal pump makes it particularly suitable as main process pump in the dairy, beverage, pharmaceutical and cosmetic industries. Summary Pumpen er sanitær og er med et meget økonomisk design, velegnet til generelle installationer i mejerier, føde- og drikkevareindustri, farmaceutisk samt kemisk industri. Summary Насос PROLAC HCP представляет собой моноблочный центробежный насос санитарного исполнения. 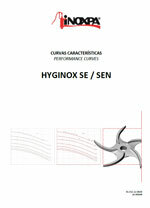 Summary La HYGINOX SE es una bomba centrífuga mono-bloc de diseño higiénico adecuada para su uso en la industria láctea, de bebidas y alimentaria en general. 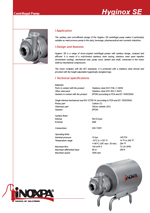 Summary HYGINOX SE is a range of close-coupled centrifugal pumps with hygienic design, suitable for use in the dairy, beverage, and food industry in general. Summary La HYGINOX SE est une pompe centrifuge monobloc à conception hygiénique prévue pour une utilisation dans l'industrie laitière, des boissons et alimentaire en général. Summary A HYGINOX SE é uma bomba centrífuga monobloco de conceção higiénica adequada para ser usada na indústria láctea, de bebidas e alimentar em geral. Summary Насосы HYGINOX SE это ряд моноблочных центробежных насосов санитарного исполнения, предназначенных для использования в молочной, пищевой, фармацевтической и косметической промышленности.